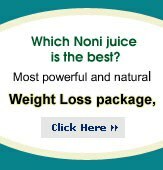 At NoniJuice.US your satisfaction is our mission. We strive in every way to make sure your experience with NoniJuice.US is positive. We understand that every product doesn't work for every person. That's why we offer a 100% money back guarantee on all unopened products to our customers. 100% MONEY BACK GUARANTEE: If you are unsatisfied with any product purchased from us for any reason you can return any unopened bottle with a full detailed written explanation of why you were unsatisfied within 30 days of purchase date and you will receive a REFUND less shipping and handling. Products must be in the original packaging. Products must be shipped back to us at the customers' expense. All merchandise must be insured properly by the customer. Refunds will be issued upon receipt of the returned products. Shipping & handling charges cannot be refunded. If items are not insured properly and get damaged or lost when returned, we cannot grant refunds. These rules apply even if you refuse any package at door. Foreign orders which are detained or confiscated by Customs are not subject for refund. Please contact us directly by email to request a Return Merchandise Authorization (RMA). Please include your RMA on the outside of any returned package. Absolutely no returns will be accepted without an RMA.